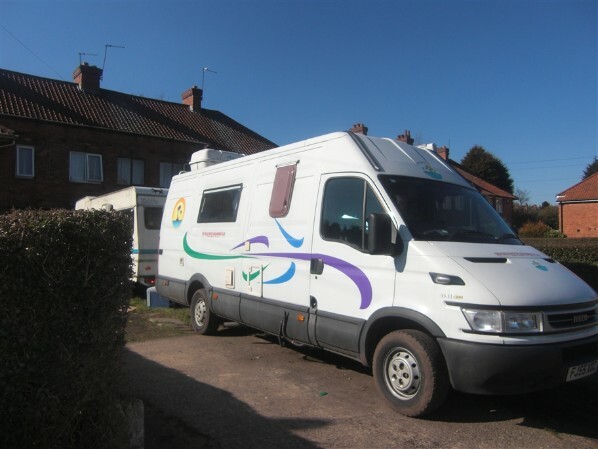 This blog details the conversion of an extra long wheel base Iveco Daily 35S 12 to a campervan, the conversion took place between November 2008 and February 2009 many thanks to the Self Build Motor home club members for their invaluable contributions of help via the website. After a lot of planning and drawing, visiting dealers and measuring vans we decided on an extra long wheelbase high top Iveco Daily. We found that apart from the sprinter this gave the longest usable interior of any panel van with over 4 metres from rear of drivers seat to back doors, but was marginally wider inside than the sprinter allowing for a 1.8 metre bed across the van. We went for the latest model we could afford which was a 2005 35s12 . 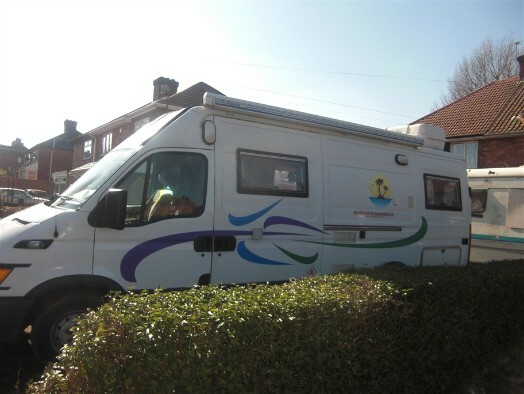 We already owned an Eldiss motorhome which as an MOT failure would be the donor for much of the equipment in the camper. After much searching and haggling we had our base vehicle. First job was to strip out all the plywood lining and floors as this was in good condition it wasput aside to be reused later for various things. Next cut out the steel bulkhead between cab and van interior. Remove the steel lining from abve the cab and fit a plywood floor here to form the base for overcab storage. Then clean the floor and lay 25mm insulation over the steel floor then relay the plywood floor, over this with a duct across the centre for wiring and water and gas pipes. We took a trip to Rainbow conversions to purchase windows and a few other things. We settled on Seitz top hung windows with integral cassette blinds and screens, these were expensive, but you get what you pay for, and these are possibly the best motorhome windows available, and are used by most of the major converters. 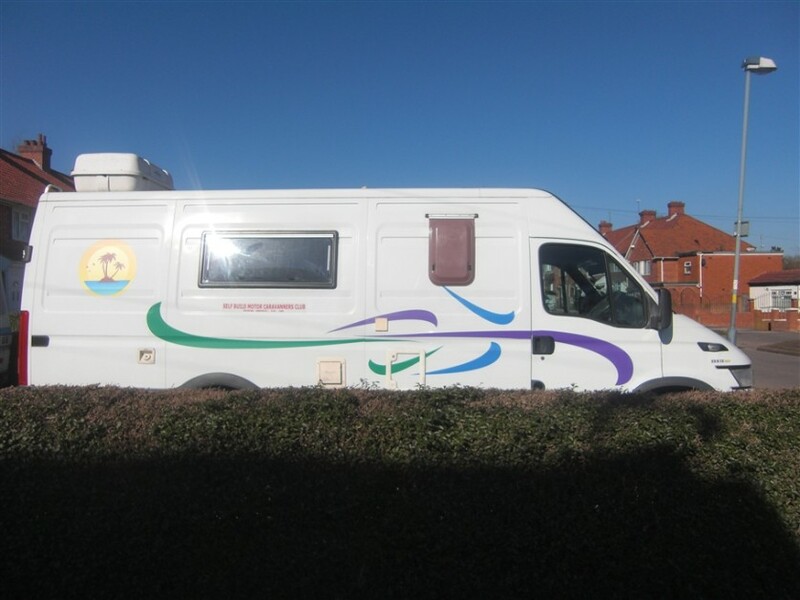 Next step was to fit roof lights, and bathroom window from donor van (Elldis 400) cut out windows and fit. There is a lot of metal in the side walls of an Iveco daily, anti-drumming panels etc that has to be cut away. The upside is you tend to remove more weight than you are adding so payload unaffected at this stage. Unfortunately the camera was stolen off the front seat while I was working, and we dont have any photos up to this point. Cut holes in roof to take 2 Hekki roof lights which were fitted for light and ventilation I had to modify the winders which raise and lower the vents to cope with extra thickness of roof with insulation. We have been using motorhomes for 12 years, so we know exactly the layout that we want, a fixed double bed was an absolute must. We had to have a freezer as well as a fridge. All the usual equipment in van hot and cold running water, gas hob plus oven and a microwave. because we were planning to spend a lot of time abroad most of our cooking and dining would be outside so a kitchen tent was purchased to house and store all the camp cooking equipment we have gathered over the years we also have a cadaq barbecue which will barbecue, fry, grill, roast,stir fry, and do almost anything else as well. We cook in the van when we are travelling and only stopping 1 night at a time, and cook outside whenwe are on site for more than a couple of nights. Next job fitted wind out awning Omnistore 5000 3.5 metre. I purchased high top awning brackets then heavily modified them to clear Iveco sliding door, then fitted Fiamma drip stop over sliding door. Fitted roof box the main purpose for this is to carry satellite dish and tripod for English TV in France and Spain, rear ladders for access to box is from CAK tanks of Warwick highly recommended company. Fiamma cycle rack for cycles of course, but also handy for carrying a variety of things. We fitted xtratherm 25mm insulation to walls roof and floor, supplemented with expanding foam and rockwool to fill gaps voids and cavities. Difference in internal temperatures felt straight away, there is no insulation to rear doors as fitting plywood bulkhead at rear of bed with insulation attached, rear doors will only give access to under bed storage not interior of van plus a small amount of storage within the doors. Cut out access panel and fit locker door for access to under bed storage from exterior of van, frame from CAK tanks of Warwick,door panel is from metal cut out to form opening in van. Wardrobe fitted with oil filled radiator in base I find that a small oil filled radiator will keep a well insulated van quite warm, and can safely be left on all night in complete silence. We also use a wall mounted fan heater to give a quick blast of heat and an almost instant change of temperature in the van. We only wild camp in the warmer months and so far have found no need for gas heating. We will be fitting a propex heater when funds allow. 2 X 110 amp leisure batteries charging from alternator through 100 amp relay wired through smartcom relay. This also powers 3 way fridge when on the move. 3000 watt maximum 1600 watt inverter for freezer and microwave when not connected to mains. gas hob and sink top fitted and working there is a under cupboard strip light above. The small freezer fits under the microwave it is mains powered and runs off the inverter whilst travelling the leisure batteries will power it for a couple of days if no hook up available. We both read a lot and like plenty of light so the interior of the van has 2 x 12 volt dome lights 4 x 12 volt strip lights and 4 x 240 volt strip lights plus LED reading light above bed, and 2 x 240 volt exterior awning lights. this was quite a beast and would not bend or give at all and I spent a considerable amount of time wrestling it into the van, I still have to fight it every time I change the fitted sheets, but it is well worth it for the most comfortable mattress we have ever slept on. fixed double bed across rear of van. Plywood rear bulkhead wall with access under bed from outside and inside.